The Funline Comfort Pen Kits are available in six finishes to match up with many different pen turning materials. They are designed with value in mind and are very economical for the turner. 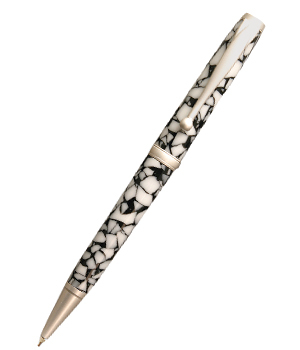 These pens can be turned using the rubber comfort grip or without it. They use 7mm tubes and are turned on our pen mandrel with the comfort pen bushings. Different finishes can be mixed for quantity discount. Bushings: Bushings are needed to turn the project on the pen mandrels we offer. The bushings are used to size the outside diameter of the workpiece correctly for the specific project. They are also used to adapt the pen mandrel for project tubes larger than the mandrel shaft. Only one set of bushings are needed for many kits. After the bushings are worn down from sanding they will need replacing.